Those "peaceable" Iranians are apparently not satisfied with committing a war crime by having paraded captured U.S. sailors on international TV in violation of the Geneva Conventions (to which Iran is a signatory), but are apparently also flouting Islam's anti-iconist tendencies. Good to see the hundred billion dollars we released to them is being repaid by their goodwill! John Stossel's recent column about one of the things The Combover has done indicates a very interesting thing; one of his signature accomplishments, so to speak, is the Central Park skating rink. Apparently the city's management of the project was so bad that one part of the rink--which from Google Maps appears to be little bigger than a standard hockey rink-- was six inches higher than other parts of the rink. In other words, his signature accomplishment was to replace the city's contractors with someone who had mastered very, very basic surveying. We are talking high school shop class with equipment from Home Depot, really. Apart from the chillers for making ice, the technical difficulty of this task really isn't beyond the ability of most small town pavement contractors, who do projects this size for farmers all the time--specifically the long barns whose stench is the bane of rural living, if you catch my drift. Moreover, most towns of any size north of Chicago have a facility like Wollman where the local hockey team practices and plays. But he did replace a group of corrupt builders with his own builders, and would have learned that in numerous places, deliberately shoddy work had been done, and reports had been falsified, in what is one of the easiest places in the world to build due to wonderful bedrock. And yet there is no record of reports being made to prosecutors. Why? Perhaps had he done so, the accused would have pointed out how he got them fired, and how he managed to use illegal immigrant labor for Trump Tower while violating OSHA regulations. In other words, he's not a successful businessman at all, but rather someone with the flexible moral and ethical commitments needed to prosper in what was then a deeply corrupt city--as Ivana and Marla might tell us. It is very interesting that the decline in Drumpf's fortunes--bankruptcies in 1991 and 1992--coincided with Rudi Giuliani's cleanup of the city as a federal prosecutor. Reviewing some of the information about the perpetrators of the atrocity in Belgium, two things strike me. First of all, since they were citizens, you couldn't have shown them the door. Sorry, Mr. Combover. While I'm all in favor of increased scrutiny of immigrants, and showing the door to those who violate our laws, that's not at issue here. Second, both of them had some pretty serious criminal convictions--one for shooting at police officers with a Kalishnikov during an attempted robbery of a currency exchange office in 2010, and another for carjacking and possession of forbidden assault rifles in 2011. One served about five years of a nine year sentence, and the other was sentenced to probation. Now of course hindsight is 20/20, but it strikes me that in these sad and tragic cases, the Belgians specifically and the EU nations in general need to consider whether it might be a very good idea to do what the United States did in the 1970s and 1980s; reduce judges' latitude to impose lenient sentences. And in doing so, it appears that they could strike at the heart of ISIS, which apparently is concentrating its recruiting among young criminals of middle eastern descent. Come to think of it, as the United States contemplates sentencing reform (a pivot back to the 1970s in many ways), we might ask ourselves what we're signing up for, too. 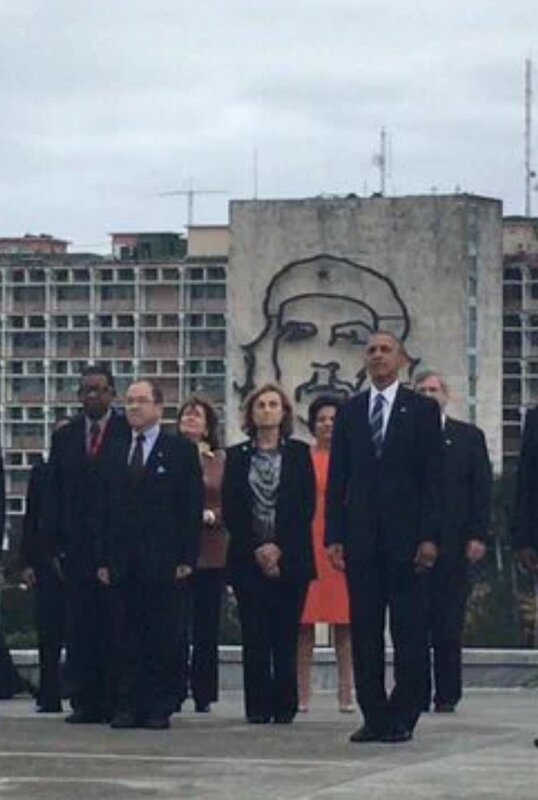 In a beautiful city like Havana (even after 50 years of Communism, it still has its spots), this is the best photo-op our President could do? 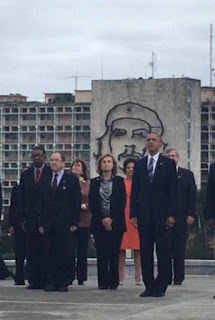 It is as if he wants to bring this kind of thing to the U.S. along with a few cigars. ...is that when you pray for humility, your team will help you. All the best in the coming year, Spartan Hoopsters! ....is the hemming and hawing the Flint Water Department, the Michigan environmental policy group, and the EPA are doing over who is most guilty for the ongoing fiasco with the water system in Flint. I'm no water engineer or chemist by trade, but I do know that those in the trade have developed tables for estimating lead solubility in various acid concentrations, and I know from personal experience that labs will test water for various contaminants for about $50 or so. In my mind, the line of questioning should start with the Flint Water Department, and they should simply be required to produce the legally mandated, certified results of water quality and the history of interactions regarding it. Then do the same for the state, and then for the EPA, and anyone who can't produce this--and explain what actions were taken, if any--gets fired and/or imprisoned. This is really not terribly complicated, except for the fact that DC is a city where a gal can flood a river with millions of gallons of mine waste and still keep her job at the EPA. Megan Gladwell comments on some indispensable qualities for a mate--good with children and the elderly, not afraid to get his hands dirty, not in love with himself, and honest--and it strikes me that these aren't just good qualities for a mate, but rather good qualities in all of life. More or less, she's got a short list of things which, in her opinion (and mine), seem to correlate reasonably well with whether or not a man is narcissistic. It also strikes me that with Clinton, Obama, and Trump Combover, we have three people who really aren't good with children or the elderly, are afraid to get their hands dirty, are in love with themselves, and are not honest. Those of us who care about our country need to come to grips with the fact that in many regards, we are starting to prefer narcissists in positions of power. It's scary in family life, and it's just as scary in the body politic. Apparently our Attorney General shares the President's familiarity with the Constitution, and is openly contemplating the possibility of filing charges against those who deny the majority hypothesis of climatology, that of anthropogenic climate change. One would have thought that even if "climate change deniers" were 100% wrong, the "First Amendment" would shield them from prosecution, but apparently the Bill of Rights is not taught at Harvard Law School. Which, of course, is exactly what we would have concluded after the former editor of the Harvard Law Review decided that it was his responsibility to sue nuns to force them to buy birth control coverage for their insurance. The Bill of Rights is obviously not his specialty, or that of the AJ, though one would figure that people who are wrong as often as they are (or outright lying) would treasure the First Amendment's protection of free speech. In a just world, the former editor and the Attorney General would not only lose their license to practice law, but there would be some very tense discussions for Harvard Law the next time their accreditation comes up for discussion. Bruce Bialosky, a tax litigator accountant by trade, reviews the Combover's claims on being audited 12 years in a row, and concludes that he is either incompetent or lying, or both. Given that anyone with Mr. Drumpf's experience must be aware of tax lawyers who are capable of parsing out his claims, I would have to argue that he is clearly both. This is as embarrassing as having a President who not only passed the bar, but also taught law, acting as if Marbury v. Madison were never decided.